Corrugated boxes are the most popular and most frequently used type of shipping containers. These boxes are made up of three sheets of paper and the combinations are limitless. There are many styles, grades, strengths and flutes to choose from. You also have the ability to add colour, printing, a bar code and even a white or brown(kraft) box. Types of grades include single wall, double wall and even triple wall. Styles include regular slotted container(RSC), full overlap(FOL), die cut custom(DC), corrugated trays just to name a few. Scroll down for some examples of the many styles. At LeanPack we can help you best determine what the best choice is for your company to meet and exceed your performance requirements, without exceeding cost expectations. The unique design provides durable, safe shipment of your products while also adding in a slight measure of protection. The enjoyable experience with LeanPack starts right from the beginning. 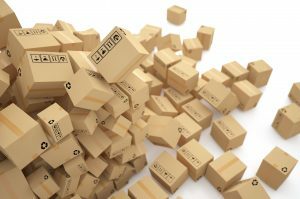 All box shapes, sizes and strengths can easily be loaded and unloaded, and are neatly stacked and organized. We don’t just sell boxes. We provide a solution for your packaging needs. Here at LeanPack, we offer a vast selection(both CUSTOM and STOCK) to ensure your expectations are not only met, but are exceeded. Stick with LeanPack and know that with each box, you will be getting material that can withstand whatever plans you have. Our boxes are built for durability, strength and convenience. Many styles below include: Regular Slotted Container (RSC), Full Overlap(FOL), Cut Out-Wrap, COW), Five Panel Wrap (5PW), Die Cut, Telescopic Body and Lid are the more popular but there are many other styles. This is the basis for which box strength is graded. In Canada we use edge crush test(ECT) and in the United States they typically use Mullin for grading. We would be happy to discuss the differences with you. Call or email Us Now To See How We Can Help!